A deputy mayor has offered a reward for help in finding a "unique" chain of office valued at £5,000. Chris Jackman, deputy mayor of Basildon Council, said the "important civic symbol" went missing following a function on 29 April. The Conservative councillor said he would pay for a replacement if it could not be found. 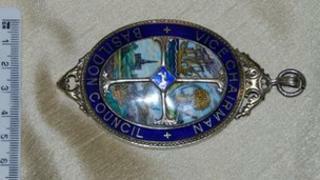 The chain dates from the 1960s and has an enamel council crest in the centre of a silver mount. Mr Jackman, who has served on the council since 2002, is offering what he described as "a small reward" for information leading to the return of the chain. "If the chain is not returned I have given an undertaking to personally raise the money for its replacement," he said. "I am particularly upset as the chain, apart from its monetary value, is an important civic symbol of our borough and therefore, of course, unique. "I am now asking local people to help me find it and return it to the council, not just for my use but for that of future deputy mayors." The council said the chain had little scrap metal value but would cost thousands of pounds to replace because of the quality of craftsmanship. Mr Jackman, who last saw the chain at the event in Ramsden Heath, Essex, said: "It is now over one month since the chain went missing. "Over that time I have retraced my steps repeatedly and spoken to everyone I can think of. I have left no stone unturned, but the chain is nowhere to be found. "I now fear it has either been stolen or somebody has taken it by mistake." The loss has been reported to police.